Ages 3+ 14" x 11" x 0.25"
Melissa & Doug Play House! Reusable Sticker Pad comes with vinyl stickers that cling securely to the sturdy pages, then peel up easily when you're ready to make a change. Five glossy, full-color pages feature five rooms to decorate; five coordinating pages of accessories include 175+ stickers to fill them up. Help get the living room ready for a party. Make sure there are enough seats for everyone in your family! Choose two of the children and pretend to be their babysitter. What part of the house will you bring them to? What sort of things will you put in the space to play with? Furnish your dream kitchen! Choose the furniture and appliances that you like best, and arrange them in the kitchen. What sort of snack would you like to make in this kitchen? Do you see any of the tools or foods you would need for your favorite meal? Make a wacky space! Mix and match the stickers to put furniture outside, floor lamps in the bathroom, a slide in the bedroom or any crazy combination you can think of. Use your imagination and have fun! Great price for the product!! 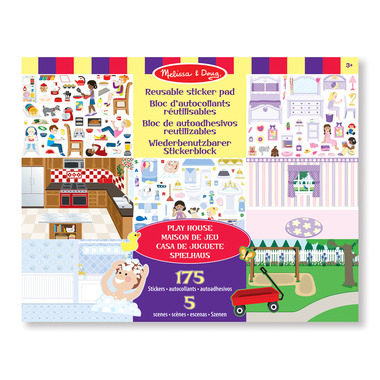 A great Melissa & Doug product at a great price! The stickers can be removed and reused again later. Keeps my daughter entertained for a long time. Bought 4 of them and love them all. Excellent for kids, love that the stickers are reusable. My son creates all sorts of stories. Recommand it! This brings me back to my childhood! My 3 year old daughter spends hours playing with this. I have also given this as a gift, and it did not disappoint. Bought for my Granddaughter who is 3, she loves it. I play with her as well, great product.